The latest model from Archer Watches is the Archer Aero CS. This limited edition of 20 pieces builds on the very successful Aero line, adding many new features. Case – the 42 mm diameter case is made of 316 stainless steel and features sapphire crystals front and back. The front crystal has an anti-reflective coating inside and out, and the back crystal also has this coating on the outside. The case has a brushed finish, and features a large Flieger crown for easy winding and setting (other crowns available upon request). Movement – based on the ETA 6497 hand winding movement, this example has many additional features. First is the central seconds complication, complete with stop function at 12 o’clock. When the crown is pulled to the setting position, the central second hand will travel to 12 and stop to allow for accurate synchronization to a known time source. 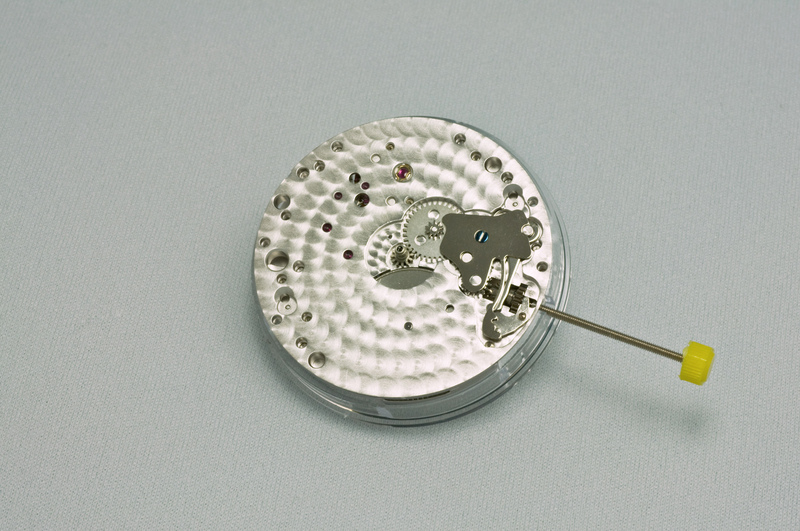 The movement also features blued screws, Côtes de Genève, and rhodium plating. Additional perlage finishing has been done to both sides of the movement as well. The crown wheel and ratchet wheel have snailing decoration added. 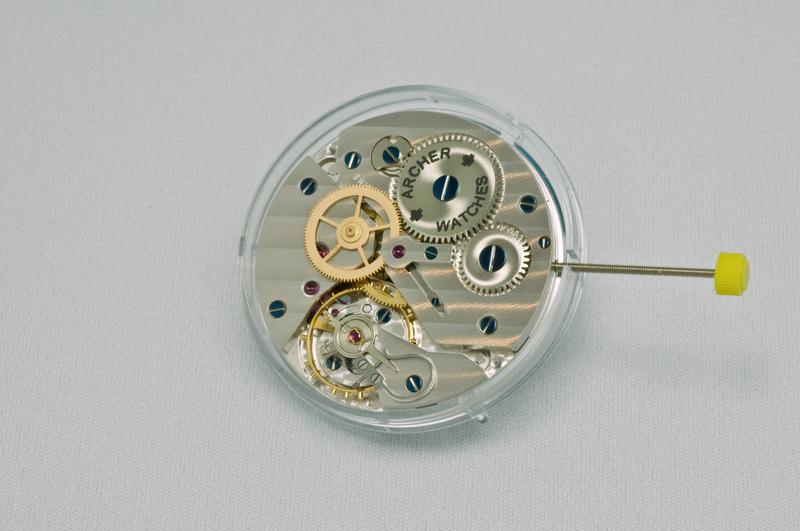 The screwed balance is made of glucydur, and the hairspring has been upgraded to Niravox 1 quality. A Swan’s neck regulator has been added for fine adjustment of the watch’s rate. Dial/Hands – the dial and hands feature strong Super-LumiNovA for easy reading in dark conditions. Strap – The Aero CS is available on a brown or black 22 mm Jürgen’s pilot strap, or on an optional brushed stainless steel bracelet. I recently received this Doxa Sub 600T with the complaint that the watch would not run for very long. The bracelet was mounted and the watch returned to the client. I was recently contacted by a client about the repair of a Panerai 113. I agreed to do the work and thought I would share the repair process here. The customer said that the watch would not wind, so the first thing that came to mind was that the set lever screw had come loose, which is common and simple to fix. However when I received the watch and tried some things it was clearly a different problem – the watch would wind but generated no power. I had a good idea what was wrong. So I’ve finished cleaning everything now, and the wait for the new mainspring begins. Now the watch is mostly assembled. I did some timing checks to make sure the watch ran well – I do this by winding the watch and putting it in a specific position (dial up, dial down, crown down, crown left, and crown up) and compare the gain or loss 24 hours later against a known standard….time.gov. Now that is installed and we are ready to pressure test the watch. The pressure testing with this type of tester involves suspending the watch in a chamber above the water line, and then raising the pressure inside the chamber. Here the watch is inside and I have raised the pressure to 10 atmospheres. After a couple of minutes I lower the watch into the water, and slowly release the pressure from the chamber. If the watch case has a leak, the pressure inside the case would have equalized with the pressure in the chamber when the watch was out of the water. Now as I lower the pressure inside the chamber, the pressure is the watch would be higher, and air would escape and show a stream of bubbles. Some bubbles may appear but as long as they are single bubbles and not a stream coming from a point, there is no leak. No streams of bubbles on this one so it’s good! Now time to mount the strap. All done and ready to be shipped out to the customer. I hope you enjoyed this look at how a repair is done. This model is the Archer Executive – blue hands version…. Both of these watches feature the very nice (heat blued) Breguet style hands. With each Archer watch that I sell, I include a document showing the build of that customer’s watch. I have always received very positive feedback on this idea from my customers, so I thought a video version showing the process would be fun for people to see. This video shows the building and testing of an Archer Aero pilot watch. New for 2009 a variation on the Archer Aero (the most popular Archer model to date). The Archer Aero II features a new case design and finish. The new case has more rounded lugs, a chamfered bezel, and a bead blasted finish for a more rugged appearance. The Aero II case is 42mm in diameter not including the crown, uses spring bars and accepts a 22mm strap. The case features sapphire crystals both front and back, and the front crystal has a double anti-reflective coating. The movement is an ETA 6497 with the hours and minutes on the main dial, and the seconds on the sub-dial located at 9 o’clock. The movement features côtes de Genève decoration, rhodium plating, and blued screws. The original Aero model is still available. This first photo is in Havana, Cuba where my team mates and I won the silver medal in the men’s Olympic competition. We lost a close one to Argentina in the gold medal match, after defeating some other teams in the early rounds (including the #1 ranked US team). I am on the right of our group as noted with the blue arrow. Next an event in Venezuela in 2001….our team in the opening ceremonies. I’m at the back in this one…. Me shooting…with a team mate to my left. And the three of us shooting in the team round at this event – we won the bronze here in a strong field of countries. I am on the right waiting my turn to shoot, while another team member is shooting, and the other is spotting the arrows – we shoot at 70 metres in this event so it’s hard to see where your arrows are hitting the target. And here I am at the athlete entrance to the US Olympic Training Center in Chula Vista, CA when I was there for a week of training. And this is me shooting there. It was a great week of training, but unfortunately it was shortly after this that my shoulder started giving me a lot of problems, and this lead to shoulder surgery in 2004. The surgery helped but in the end it wasn’t enough to allow me to continue competing at this level. Anyway, I hope you enjoyed the photos! Today I wanted to show a couple of the watches that I have been making. The first is called the Archer Aero. This is a watch styled after the WW2 German pilot watches, and is my most popular model to date. It is housed in a 42mm stainless steel case, with sapphire crystals front and back. The front crystal has anti-reflective coatings on the inside and outside of the crystal. The watch houses an ETA 6497 movement. 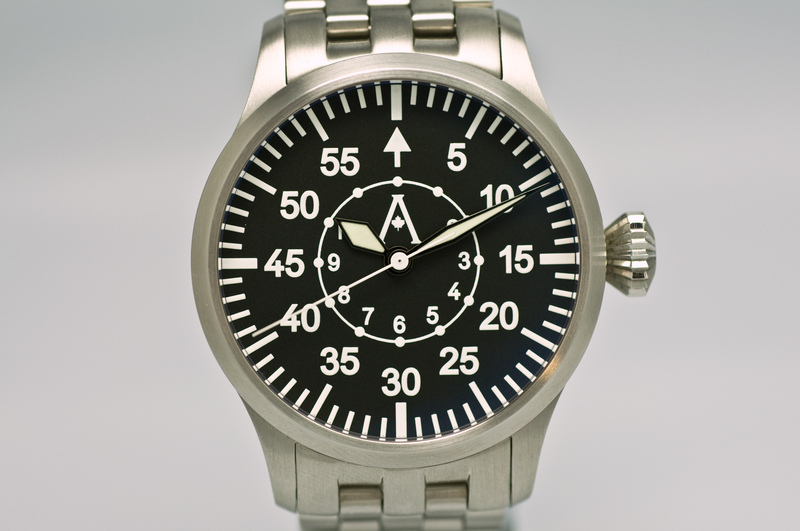 The watch is wound using the large flieger crown. 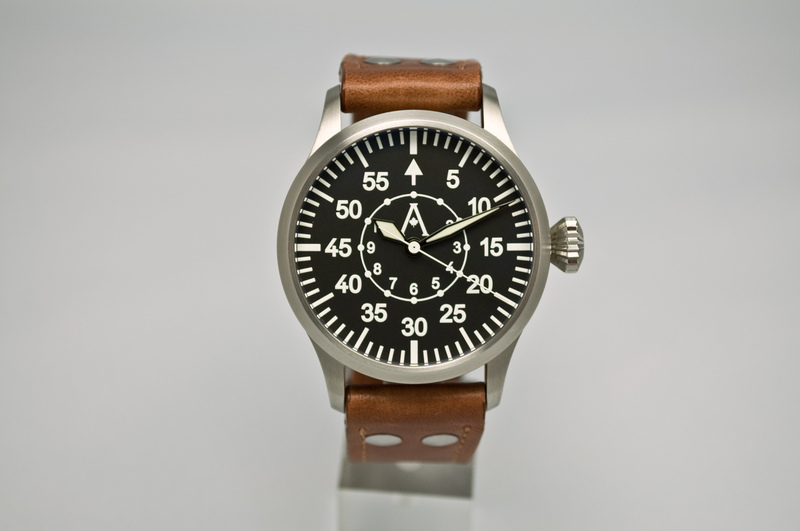 Here is a photo of one on a black Jurgens pilot strap. 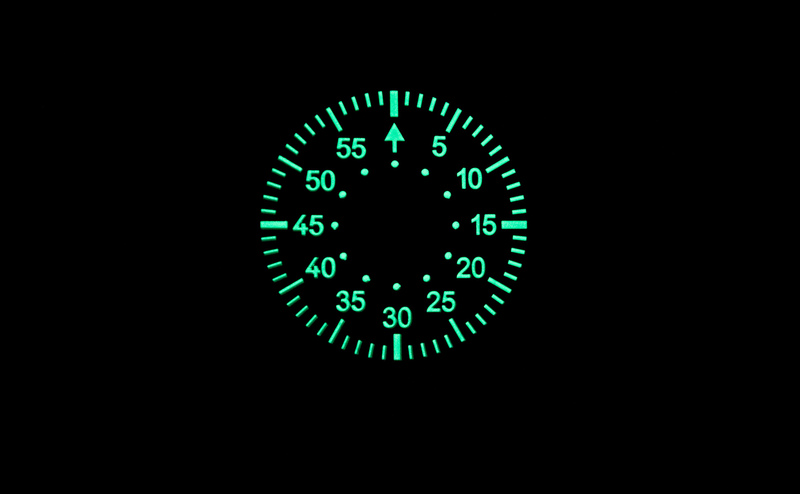 Here is a shot of the lume on this watch – it glows very brightly in the dark! The second watch is called the Archer Executive – this is the “Silver Edition” with silver spade hands set on an enamel lacquer dial complete with Roman numerals. This watch uses the ETA 6498 movement. Again the case is 42 mm so this is an ideal dress watch for those who prefer larger watches. The name “Archer Watches” comes from the sport that I have loved for over 30 years – archery. I’ve had 2 archery “careers” in my life, the first starting at the age of 12 when I stumbled upon a demonstration by the local archery club. It was love at first sight, and that lead to 8 years of shooting and competing, mainly in the junior ranks. I was successful locally and provincially, and in 1981 won my first national championship. I won 2 (indoor and outdoor) in 1982. I gave the sport up as I moved on from high school and continued my education, but the second archery career was to come. It all started as I watched the 1996 Olympic Games in Atlanta, and although I didn’t see any archery on TV (not exactly a TV friendly sport) I began to wonder…”was I good enough?” I was presented with a choice – don’t take up the sport again and always wonder, or give it a shot and work at it even though there was a risk of not making it. I decided I needed to try – not knowing was just not an option. I started in earnest in 1997 when the coach of the Canada’s Olympic team at the Atlanta Games agreed to be my personal coach. She worked with me a lot and I had some struggles early on, but then things started to take off. By 1999 I was able to win the men’s Canadian Target Archery Championship. Over the next few years I did a lot of travelling and shooting, and had some wonderful experiences competing internationally. I never did make the Olympic team, but I would not trade the experiences I had for anything. I had to give the Olympic style shooting up recently since I have a type of arthritis that makes the training schedule required to shoot an the level I once did quite impossible to keep. My focus has shifted to watches and this is another all-consuming passion in my life. I will post some photos of my archery days in the next while, so stay tuned!